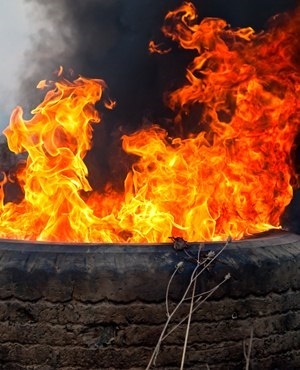 The N2 highway between Somerset West and Cape Town is in chaos as alleged "land grabbers" have taken to the streets, burning tyres, setting vehicles alight and pelting cars with stones on Thursday morning. The N2 outbound is reportedly closed to traffic at Somerset West Main and the N2 inbound is closed to traffic at Broadlands Road. According to Heyns de Waal, chief operating officer at GBMED RESCUE, protests began at around 21:00 on Wednesday. "There have been land grabs along the N2 on Sanral's property. These land grabbers have been erecting poles all week. The SAPS and metro police then moved in to remove them and everything then just erupted into chaos," De Waal told News24. "At first they started burning tyres sporadically, but they came out in force at 21:00 and started targeting businesses along the N2 at Broadlands Road. We then deployed officers to the scene." According to De Waal, protesters rolled burning tyres into shops and completely destroyed a liquor store, running off with crates of beer and other alcohol. "All that's left of that liquor store is its walls and roof," De Waal said. De Waal's security company attempted to contain the situation until 02:00 on Thursday when they managed to break up the crowd with the assistance of the police. "They came back again at 06:00 [on Thursday morning]. It's as though it's been well organised. They [protesters] are all along the N2, into the city, even. I can see black smoke billowing from my house." Security officials have been deployed as protesters starting attacking vehicles on the N2. "We are currently monitoring the situation with the police. The N2 has been closed from the Broadlands offramp. Protesters are burning tyres. We can't even get to them, they are throwing stones at us." De Waal said he had received reports of similar protests taking place at the Spine Road offramp, Jakes Gerwel and Nyanga. The N2 at Somerset West and Lwandle remains closed in both directions due to violent protests. "It all started at exactly 06:00. So we're currently dealing with four incidents of violent protests that started at 06:00." De Waal said protesters are angry because they allege ANC councillors had told them they could occupy land on Sanral's property. "So when the police moved in [on Wednesday] with the Red Ants and chased them off, they retaliated." De Waal says protesters also set cars alight on Wednesday night. Western Cape police could not be reached for comment. This will be added once received. UPDATE: According to Maxine Bezuidenhout, principal inspector at Cape Town Traffic Services, protests in Khayelitsha are affecting the whole area. "Most access routes to and from Khayelitsha [are] closed [and] obstructed, Bezuidenhoud said in a WhatsApp to News24. She said there was no access to and from the area. According to Bezuidenhout, Baden Powell Drive is closed both ways between Swartklip Rd and Oscar Mpetha Road due to violent protest action.